Affordable camping accommodation already set up on site. Leave the tent at home and avoid the adverse effects of driving rain, or the chore of drying out a wet tent when you get home! The Pods are already set up on site – just bring all your camping gear, but leave the tent behind! The Pods provide a shelter from the changeable weather conditions which affect the Lake District. The roof is made of a special material designed to cut down the noise of heavy rain. 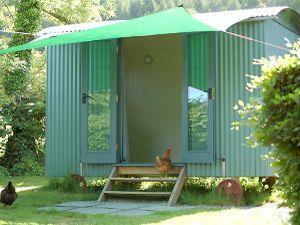 Lanefoot Farm Pods & Shepherds Hut sometimes limits bookings to 2 or more days. 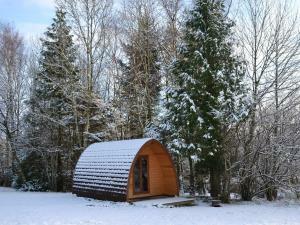 The Family Pod is available for 2 adults and 2 children only, it is not suitable for 4 adults. Family Pod sometimes limits bookings to 2 or more days. The Pods are suitable for 2 adults. Pod 2 sometimes limits bookings to 2 or more days. Shepherds Hut sometimes limits bookings to 2 or more days. Situated between the villages of Thornthwaite and Braithwaite, approximately 2 miles from Keswick in the North Lakes. From M6 Motorway, exit at Penrith junction and follow A66 towards Keswick. Travel past Keswick, and the viillages of Portinscale and Braithwaite. Leave A66 at Thornthwaite turning, on left. Follow road downhill for 0.5 mile. Lanefoot Farm campsite is at the bottom of the hill on the left. Great location and some good walks. Close to local village. Love the chickens wandering around!